For years, I have been hearing rave reviews of The Amazing Adventures of Kavalier & Clay, a novel for which Michael Chabon won the Pulitzer Prize for Fiction in 2001. 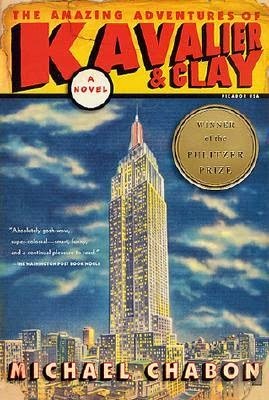 I’ve only read one other Chabon novel, The Mysteries of Pittsburgh, which I liked OK but didn’t love, and all I knew about Kavalier & Clay was that it won the Pulitzer, was very long, and had something to do with comic books…so I kept putting off reading it. Finally, one of my book groups chose it last month, and I am so glad I finally found the time to read this epic novel about a lifelong friendship, set against the turbulent 1930’s and 1940’s. Sammy Clay is a young Jewish man in Brooklyn, living with his mother and grandmother and working for a novelty company. He loves America’s latest invention, comic books, and dreams of being an author or comic book writer someday. From the other side of the world, Sammy’s cousin Joe travels from Prague all the way to Brooklyn; his family used every resource they had to get him out ahead of the Nazis, in a covert escape to rival those of Houdini, whom both Joe and Sammy admire. The two cousins meet when Joe arrives in the middle of the night and are soon fast friends. Within days, Sammy’s dreams suddenly seem to be within reach, when he sees what an amazing artist his newfound cousin is. Together, the two of them create a their own superhero, The Escapist, in the new tradition of the already-popular Superman, and convince Sammy’s boss and some colleagues to take a chance with them. Their success tracks along in time with Hitler’s rise and leads them into a lifetime of adventure, love, and sometimes painful sorrow. I said this was an epic novel, and it is in several different ways. It follows the young men’s friendship for 20 years, with flashbacks to their childhoods, as it follows world events from the late 1930’s and Hitler’s rise to the post-war world of the1950’s. The readers go along for the ride as Sammy and Joe’s characters rise to fame along with their creators. There are plenty of surprises along the way for both young men and for readers. As the mother of two young men, I can attest to the truth of this statement! Interestingly, of the six people who came to our book group discussion for this book, three of us loved the book, and the other three strongly disliked it. Of those three who did not enjoy it, two were elderly women, one didn’t finish it, and all three said they had no interest in comic books. What surprised me was how much I DID like it, since I also had no interest in comic books (probably part of the reason why I didn’t read the novel earlier). I experienced it more as a book about friendship, love, and life, with a backdrop of history and comic books. All in all, I am glad to have finally read this remarkable novel, and I still find myself thinking about the characters a month after finishing the book – for me, that is always a sign of a good book. This looks great! I never would have looked twice at this book without your review. Thanks! Thanks for sharing with #smallvictoriessunday. l have heard of this book but didn't know it was 650 pages, was part historical fiction, part literary fiction, or dealt with comic books! Sounds interesting.